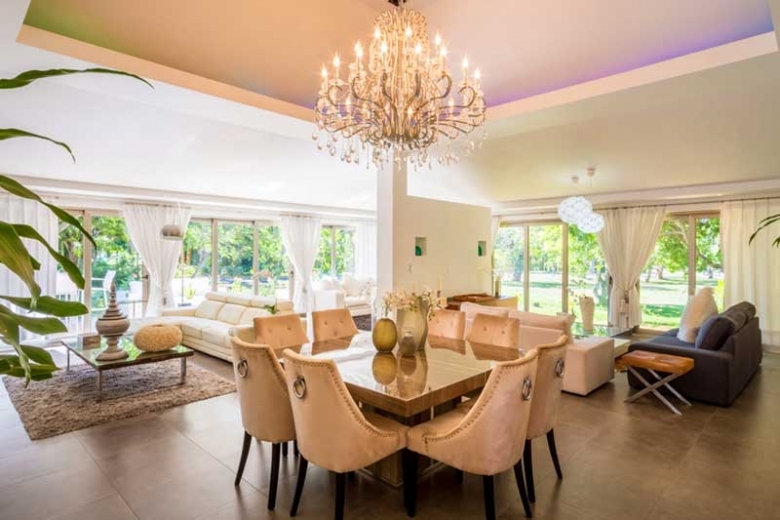 We are proud to offer you the best rental villa collection in Casa de Campo. We invite you to view them in detail and contact us for availability special deals. CASA PALMA newest addition is a mega salt water Jacuzzi. Try it after golf and complete your SPA experience with TWO complimentary massages ! 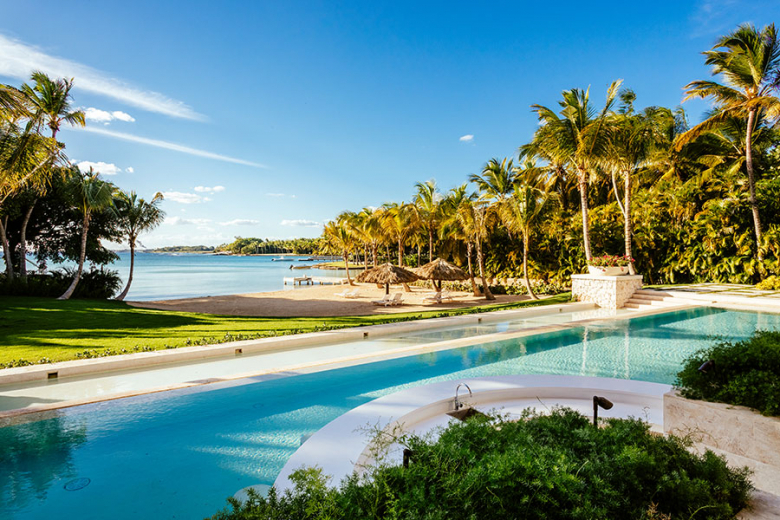 Casa Palma sits in one of Casa de Campo’s most exclusive locations, Costa Verde, with breath taking views of the critically acclaimed Teeth of the Dog Golf Course and the majestic sparkling blue waters of the Caribbean Sea. 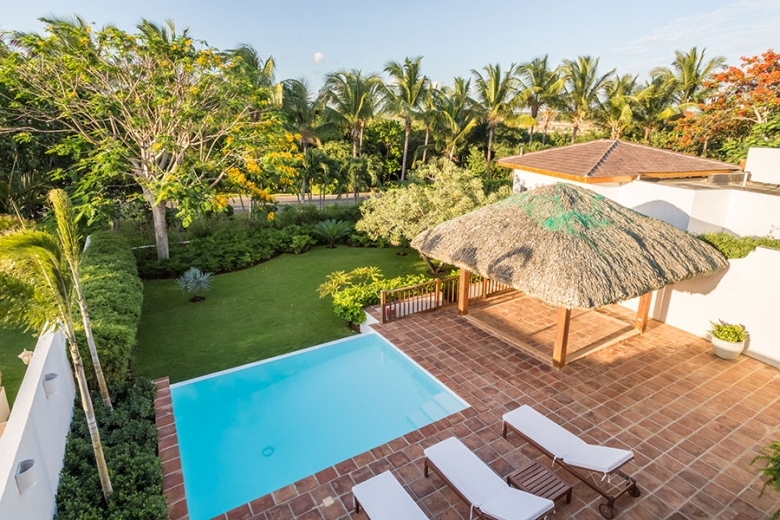 Bring your vacations to a next level with the modern elegance and charm Casa Palma has to offer! The palatial two-story villa is a modernist work of art. Simplified forms, clean lines and open spaces create the perfect setting for uninterrupted views of the Caribbean from the most of the house. 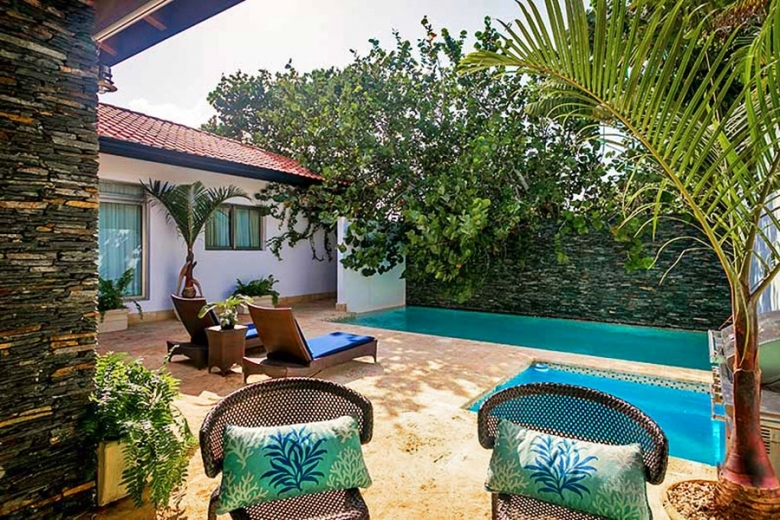 Accommodations include 6 exquisite bedrooms: 2 masters with a private terrace upstairs, and another downstairs, all facing the ocean for spectacular sunrises and sunsets. 3 secondary downstairs bedrooms comfortably appointed with 2 queen beds each, private, beautiful bathrooms and walk in closets. 12 BR: sleeps up to 25 guests. 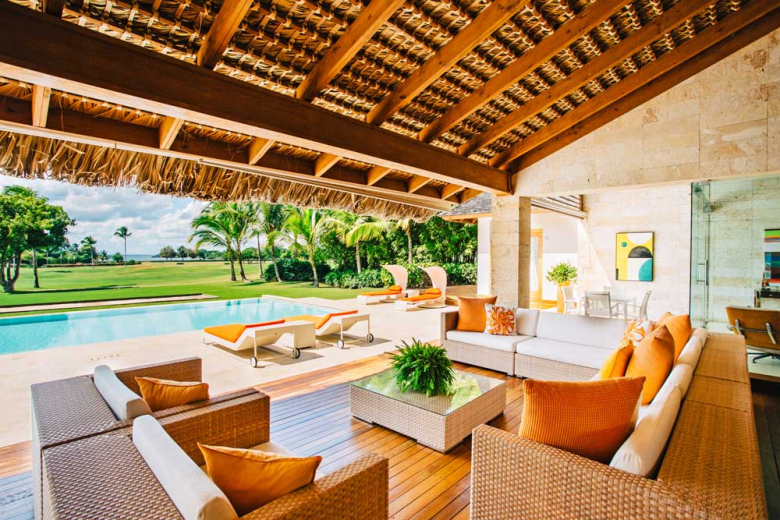 Casa Bahia, the newest addition to our luxury villas portfolio is, without a doubt, the most special home in Casa de Campo. Tropical outdoor and indoor gardens define large, but intimate, sitting spaces designed for memorable moments with friends and family. Most of these spaces face the main attraction: majestic Caribbean sunsets on the villa’s private, white-sand beach on Minitas Bay. Extraordinary sea front property with a Balinese - zen, sanctuary feel to it. Exquisite architectural and design details in chromatic brown-beige woodwork with lilac accents for a casual, yet, very refined elegance. Breathtaking panoramic seafront with swimming access, expansive infinity pool, multiple outdoor spaces, and luscious landscaped gardens. 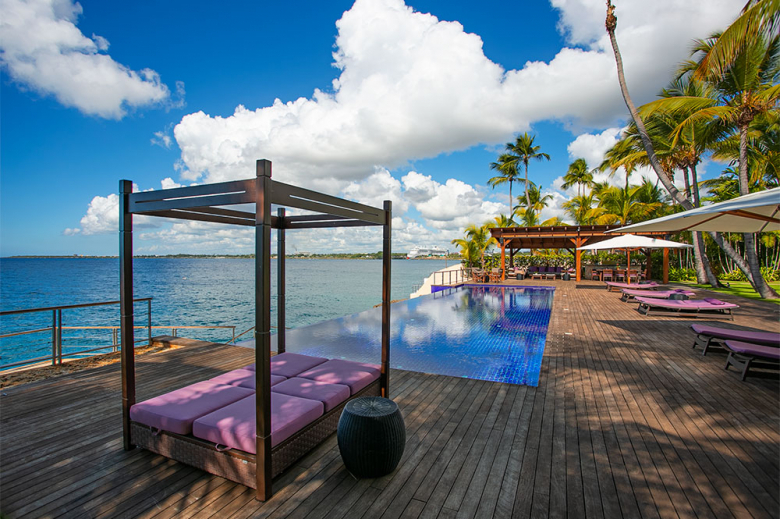 A stunning sea front residence, one of the best in Casa de Campo. 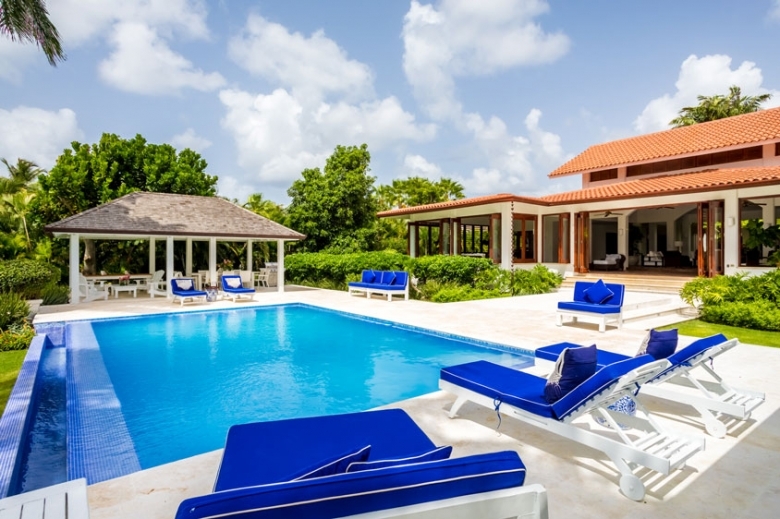 Picture yourself on this beautiful SEA FRONT Caribbean Hacienda where the glamour of the big Plantation house is recaptured in pristine white living, dining, halls, gazebo and a lush, huge garden and lawn. 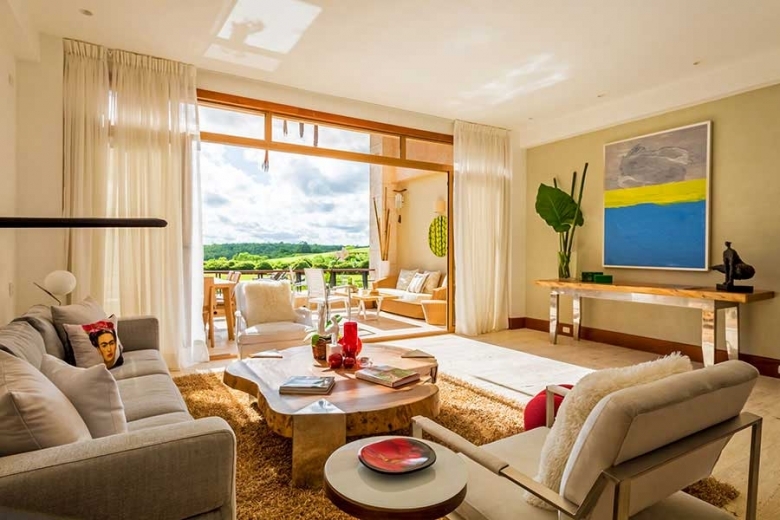 Exquisite contemporary architecture makes Cacique Modern a top choice for your next vacation in the Dominican Republic. 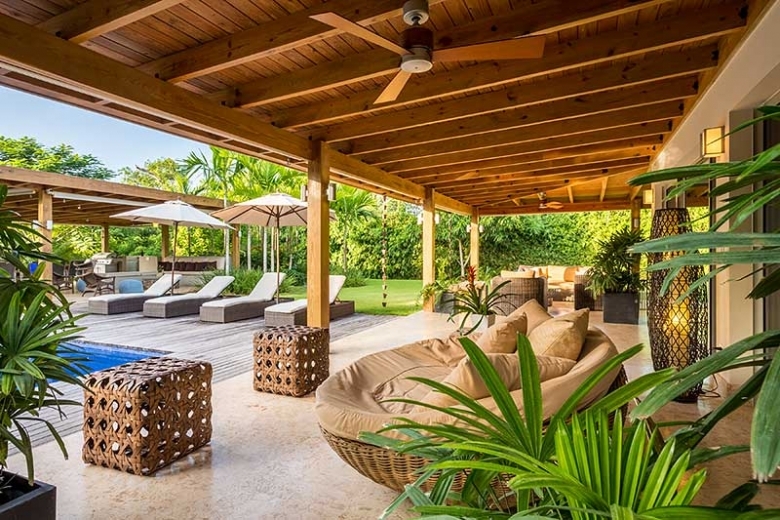 This modern jewel is situated to offer stunning views of Teeth of The Dog Golf course and the warm, inviting, clear-waters of the Caribbean Sea. This heavenly abode provides tropical pampering at its finest. Prepare yourself for the perfect holiday in the sun! This is a very rare find in Casa de Campo: larger, corner lot, brand new, ultra modern yet, ultra comfy, spacious yet, cozy. 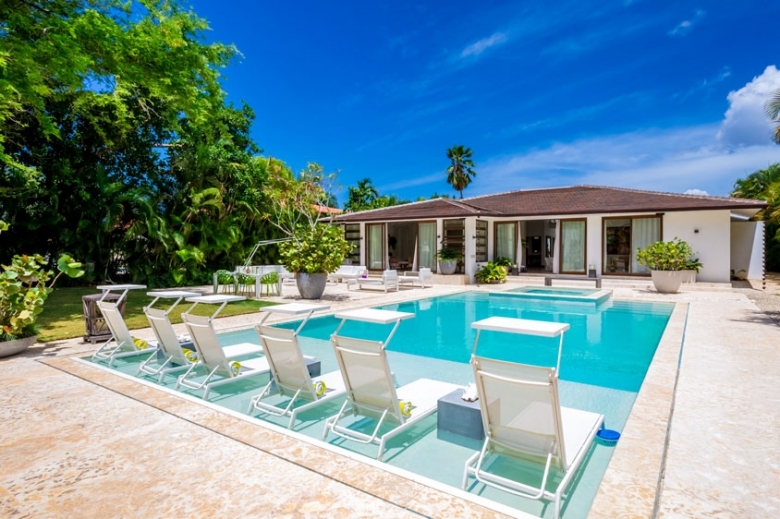 European Chic is a state-of-the-art and impeccably decorated villa that features spacious living & dining areas, plus a wonderful gazebo over a modern, swimmers-length pool surrounded by a gorgeous tropical garden. 5 super comfortable bedrooms with a master BR that is a dream come true. Exquisite finish is evident throughout. Also offers a private office where you can keep the work routine while the kids are having fun! A perfectly equipped modern kitchen and a very good staff of waiter, cook and maid. This is a very comfortable, beautiful Villa! Very convenient location overlooking the Marina, walking distance to restaurants and shops yet, VERY private. A true elegant / modern / perfectly equipped villa. Two stories with sea and river views from the second floor. Exquisite woodwork with tropical Bali style interior design surrounds water mirrors, fountains and pool: a very fresh, relaxing and Zen experience. Luxury Equestrian Estate. Close to the beach, with big, lush gardens. Very private, great spaces and golf view pool and terrace makes this 4BR villa a winner for family vacations. It has everything you need to have a great vacation without having to leave the grounds. Perfect location, exquisite design and mega chic decor define this wonderful choice just a 5 minutes walk to the beach. 5, very comfortable bedrooms, large living and dining areas plus a very large pool with integrated hot Jacuzzi. 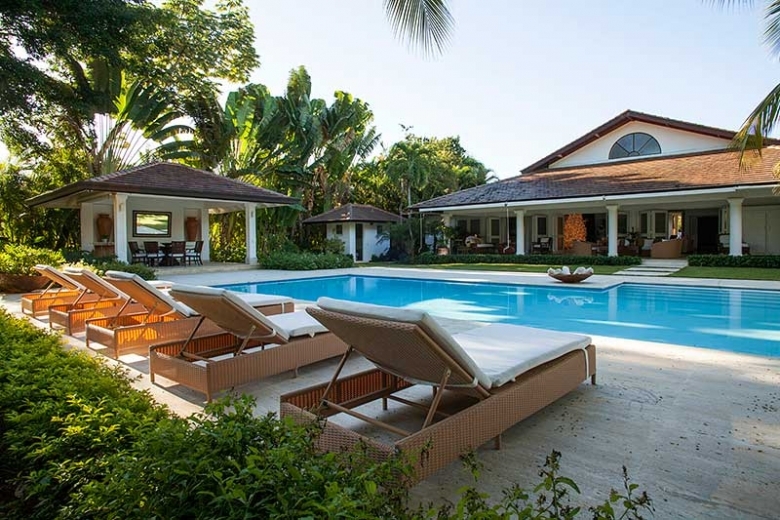 Nestled in the private and tranquil neighborhood of Punta Aquila, on the world-famous Teeth of the Dog golf course's hole #13, sits Casa Clarita, a private vacation rental which offers comfortable living spaces in which to lounge, entertain and unwind with good friends and family on holiday in the Dominican Republic. Cozy, luxurious comfort, close to everything! Lovely, 3 BR, 3.5 Bath townhouse with gorgeous gardens, located two minutes walking distance from the Marina and five minutes driving from the beach. This property comes with an extraordinary cook, cleaning lady and gardener/pool man. 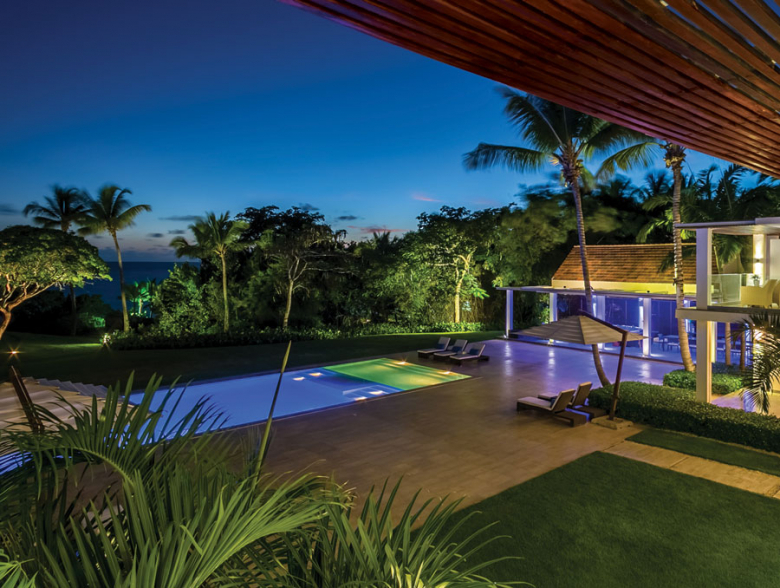 Exquisite modern villa surrounded by golf greens and luscious tropical gardens. 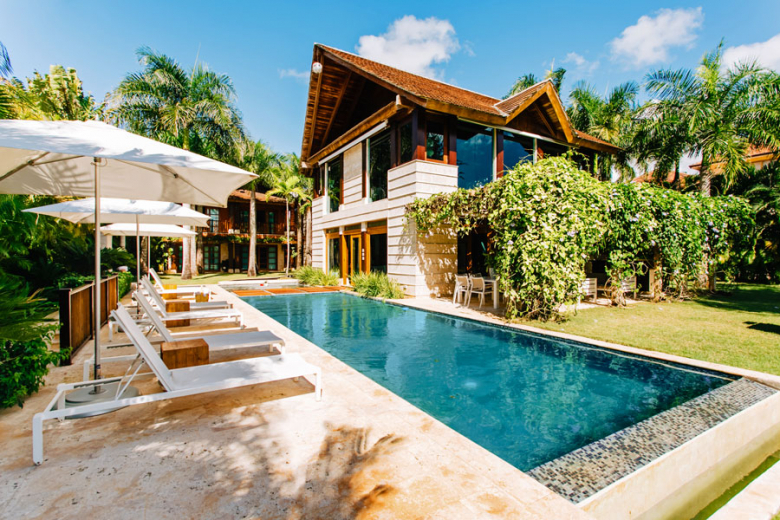 EXCELLENT choice in Casa de Campo. Walking distance to Hotel and beach on a very private spot. Pool and Jacuzzi. PLUS this villa has a big family room/ game /pool table area, great kitchen, maid-cook and an excellent waiter. This villa, in terms of space, service and finish offers much more than others this size. 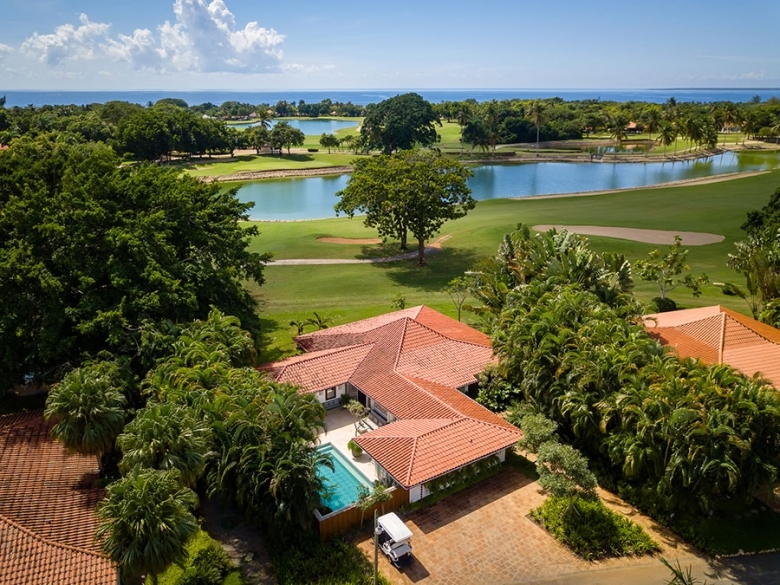 With breathtaking vistas of the best lake-golf area of the Links Golf Course, this beautifully decorated villa is the winner of the Golf Villa scene in Casa de Campo. Classic golf villa design, exquisite decor with ethnic feel.